“Marist/NPR/PBS Poll shows President Trump’s approval rating among Latinos going to 50%, an increase in one year of 19%. Thank you, working hard!” Trump tweeted. 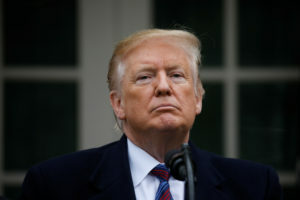 However, the president overlooked the core finding of the poll, which showed that 57 percent of registered voters said they would definitely vote against Trump in 2020, compared to just 30 percent who said they would back the president. The president’s assertion that the poll shows an increase in support from Latino voters also requires context. The United States’ Latino population is diverse, said Barbara Carvalho, the director of the poll. Last week’s survey was a look at Americans as a whole, and not a poll of Latinos in particular, so the president’s claim about his popularity with Latinos wasn’t “placed in context,” Carvalho said. As part of the survey, 1,023 people were asked: “Do you approve or disapprove of the job Donald Trump is doing as president?” President Trump was correct in that saying that 50 percent of the Latinos who were questioned in the survey said they approved of his work as president. But only 153 Latino Americans were interviewed for the poll. The small sample size of Latino respondents had a “wide” margin of error of 9.9 percentage points, Carvalho said. That means the 50 percent approval rating among Latinos that Trump cited could range from 40 percent to 60 percent. Trump’s tweet also asserts that the last polling survey pointed to a 19 percent increase among Latino support. However, according to a January 2018 PBS NewsHour/NPR/Marist poll, 27 percent of Latino adults approved of the job Trump was doing as president. A year later, the 50 percent of Latino approval would amount to a 23 percent increase, not 19 percent. However, it’s not immediately clear which past poll the president was referencing. Trump’s tweet on the poll also didn’t mention that 46 percent of Latinos disapproved of his performance as president. Another four percent said they were unsure. Marist releases information on various subgroups interviewed in the poll to be transparent about its polling methods. NPR and the NewsHour didn’t focus on the subgroup in its coverage of the latest poll, partly because of the wide error margin and small sample size. When dealing with groups within a larger poll, it’s important “to be statistically cautious” because the results are estimates, Carvalho said. And in surveys focused on Latinos’ views of Trump and his job performance, the president’s approval rating is consistently underwater. According to a Pew Research Center’s survey from October, only 22 perfect of Latinos said they approved of Trump’s job as president, while 69 percent said they disapproved. Pew has previously explained how language barriers and cultural differences could affect Latinos’ responses in surveys. A closer look at the data also shows the numbers varied by party affiliation. Fifty-nine percent of Latinos who identified as Republicans approved of Trump’s performance — significantly lower than his overall approval rating among Republicans — while just 8 percent of Latinos who identified Democrats shared the same view.